The city of Bordeaux was dominated by the British for three hundred years. Nicknamed as “La Belle au Bois Dormant (Sleeping Beauty)”, today the city is noted for being a flourishing tourist hub. Besides, it also makes a great destination for wine lovers. Alain Juppé, the mayor and ex Prime Minister, has immense contribution in restoring the rich neoclassical architecture of the city. And, what’s even worth mentioning is that his efforts were recognized and by mid 2007, half of the city was listed by the UNESCO as World Heritage Site. Besides luring about 2.5 million tourists every year, the city also carves a niche for its diverse university student population. By Air: On the west of the city stands the Bordeaux-Mérignac Airport. This regional airport basically serves domestic flights; however, a handful of international flights can also be availed from here. More specifically, the connecting flights to London, Paris, Amsterdam, and Madrid do halt at this airport prior to leaving for the final destination. After reaching the airport, a public transport can be availed to reach the downtown. By Train: Located approximately four kilometers from the central location, Gare Saint Jean is the chief railway station of the city. One can avail trains to Paris, Angoulême, Poitiers, Toulouse, Marseille, Montpellier, Périgueux, and Clermont-Ferrand from here. After arriving at the railway junction, taxis, trams or buses can be taken to reach the desired destination within the city. By car: One can take the A10 or N10 highway from the north to reach the city. Similarly, from the south, A63 highway can be taken. If one is coming by car, then it would be better to skip driving from 8 to 10 am and 4 to 7 pm because the beltway remains crowded during these hours. Bordeaux is the perfect destination for wine lovers and the best time to visit the place for some intoxicating collections is September or October. In Bordeaux, whether it is a boat ride, a day out at the water mirror or an adventurous journey to the Pey-Berland tower, there are plenty of attractions to make one fall for this city. Wine lovers are sure to enjoy to their fullest in Bordeaux. Noted for being a prominent wine producing area across the globe, the must see areas for wine lovers here are Margaux, Sauternes, Saint-Emilion, Pessac-Léognan, etc. Adventurous people will get plenty of activities to explore starting from sailing, golfing, cycling, and extending up to skating, segway, karting, skateboarding, and other water sports activities. The city is also remarkable for its architectural wonders. Whether it is the historical monuments, art galleries or the charming gardens, one will never be deprived of options when in Bordeaux. The must see attractions here, include the Bordeaux Musée des Beaux-Arts, the Musée d’Aquitaine, the Grand Théâter, and the Grosse Cloche, to name a few. Bordeaux is an ideal destination both for leisure travelers as well as business professionals. 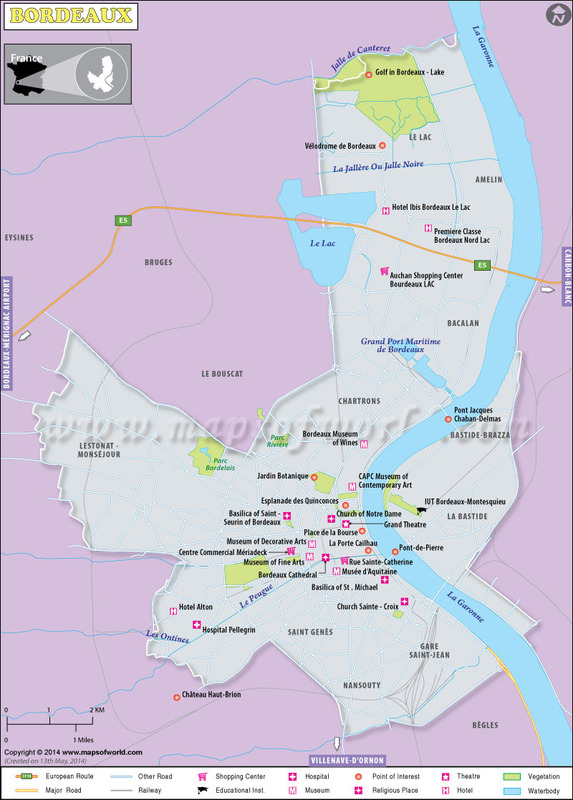 Some of the best hotels and serviced apartments in Bordeaux, include Hôtel De Sèze, Hôtel Campanile Bordeaux Centre-Gare Saint-Jean, La Maison Du Lierre, Hôtel Mercure Bordeaux Centre, Hôtel De La Tour Intendance, Hôtel Continental, and Les Sources De Caudalie, to name a few.